The first generation Loue?t spinning wheels, like the S10 and S17, all have a single belt bobbin drive with an adjustable flyer brake to regulate tension. 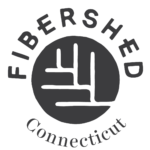 This results in spinning wheels that are very easy to learn how to spin on, and also very suitable to spin thicker yarns. Sturdily constructed of lacquered solid beech and laminated birch, it is also suitable for production spinners. The single hole in the wheel leads to a balanced flywheel, which ensures, that the wheel always stops in the place where you stop. 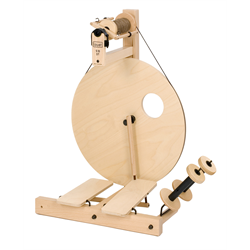 The bobbins have a sheave with three settings that can be used to obtain three spinning speeds or ratios. 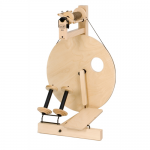 By using different types of bobbins and flyers, Loue?t spinning wheels can be used to produce every kind of yarn, from coarse wool to fine silks. 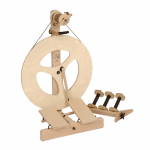 Each wheel comes equipped with a two bobbin lazy kate. 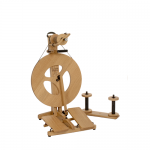 A High Speed Set is also available for this wheel for easier spinning of very fine yarns. Finally, an excellent spinning wheel must turn freely and quietly. Accordingly we use maintenance-free ball bearings in the main hub and at the footman connection. (No lubrication is required). The spinning wheels are disassembled to the extent that they can be packed flat and shipped economically. The assembly consists of tightening two nuts for which tools and instructions are included.